This past weekend a group of Digital History students drove down to Daulphin County Historical Society to take a peak inside the archives. We took time out of our Sunday to begin research for our digital exhibits on the City Beautiful Movement in Harrisburg, Pennsylvania. Upon arriving, we noticed the connection Harrisburg still has to the City Beautiful Movement. Located on South Front Street, DCHS overlooks one of the major projects undertaken during the City Beautiful Movement, the Harrisburg Park System. After taking a minute to appreciate the view and its connection to our work, we walked through the beautifully preserved mansion and stepped into the archival building. Here, one of the archivists on site gave us a brief introduction to the logistics of the archives, 902 manuscript groups, photographs available through two computers on site, and general rules of completing research at this archive. Once we learned the workings of this archive, it was time to start our research. I inspected the contents of Box 1 from the J. Horace McFarland collection (MG 229). Seventeen folders in all, this collection contains scrapbooks, published works, and photographs dating from 1877 to 2004. I rummaged through the folders in box 1, searching for any sources related to the City Beautiful movement and I was not disappointed. 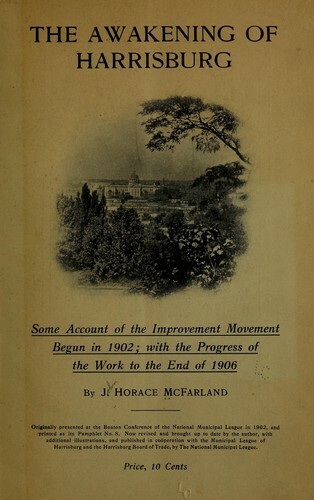 Tucked neatly away in folder 4 was a copy of McFarland’s “The Awakening of Harrisburg,”an address written under the direction of Harrisburg’s Municipal League outlining the City Beautiful movement up until 1906. I spent the next half hour reading through the delicate pages of this book. Its pages were filled with information, such as pictures of garbage ridden shores of the Susquehanna in 1902 as well the new riverside parks constructed in 1906. As this address profiles the origins of the movement, the creation of plans for improvement, and how those improvements panned out, it will prove useful to most, if not all, groups in creating exhibits for our Omeka website. Check back to see how our research is going!